Beautiful Boy manages to accentuate the devastation addiction brings on the whole family while also highlighting not only the big problem this country faces but also the science behind the chemical reaction the drugs cause on the human body. According to one report, there are approximately 80,000 drug addiction related deaths each year in the United States alone and opioid addiction is reaching epidemic proportions worldwide. For so many treatment centers don't really seem to work in the long term so it is a triumph if someone can get clean and stay sober for a year. The toll the addiction takes not only on the user but the whole family is devastating. It is physically, mentally, emotionally and financially draining and often the results are mediocre with addicts relapsing more than once. Beautiful Boy, the new movie from Amazon Studios, chronicles several years in the life of an addict and his family. Based on the novels by father and son writers, David (Steve Carell; The Office) and Nic (Timothee Chalamet; Call Me By Your Name) Sheff, Beautiful Boy takes us inside their world as each struggles to make sense of it all. David is remarried and Nic has lived with his father much of his life. As David reminisces through flashbacks we see Nic as a happy, young boy. However, as his teen years set in, he becomes more withdrawn, which David attributes nothing more than normal teenage angst. By the time He realizes Nic has a problem it is too late as Nic has graduated from Marijuana and alcohol to Crystal Meth. David spends the next few years trying to help Nic who goes to rehab and gets clean only to relapse after a time. As Nic struggles, we watch as David falls deeper into despair until he finally gives up on Nic and heartbreakingly administers some "tough love" refusing to give Nic money or allow him back into the house. As David and Nic's Stepmother, Karen (Maura Tierney; ER) attend support groups to try and make sense of what has happened we see Nic in the bathroom of a restaurant shooting up and ODing there on the dirty bathroom floor. With a strong script, haunting visuals and a great cast, Beautiful Boy has a lot to offer. Carell and Chalamet are a forceful team on screen and their familial chemistry can be felt. It is heartbreaking to watch this vibrant young man descend into an opioid haze while his father stands by helpless and wondering what he did wrong and why he can't "fix" this. Tierney and Amy Ryan (Gone Baby Gone) as Nic's Mother, Vicki, take on an emotional rollercoaster of anger and despair as they see Nic spiral out of control. The scenery of California is displayed through a muted lens much of the time but is still striking. The vast contrast between the wooded landscape of David's home and the starkness of the various rehab centers is jarring but effective. The story is sobering (no pun intended) and disheartening, especially for the parent of teenagers. Unfortunately, it is also a little too antiseptic and clean for a gritty drama about an addict and his parents. While there are fights they are not necessarily cursing filled rants and we rarely see Nic at the bottom of the barrel until the end of the movie. Beautiful Boy manages to accentuate the devastation addiction brings on the whole family while also highlighting not only the big problem this country faces but also the science behind the chemical reaction the drugs cause on the human body. This aspect is truly a revelation and almost makes some sense out of an emotional and draining story. Luckily for the real-life Nic and David, this story has a happy ending for now, as Nic is 8 years sober and, like his father, is a successful writer. This movie and the books it is based on should be required viewing/reading for teenagers and their parents. 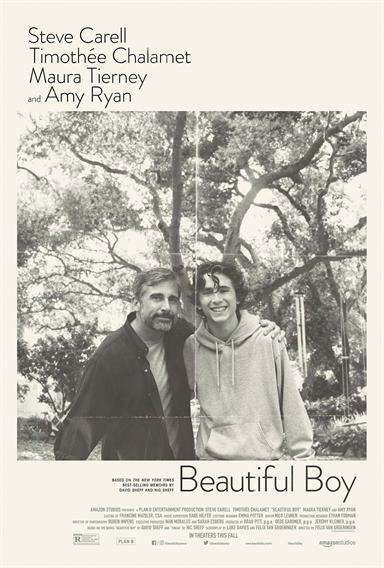 For more information about Beautiful Boy visit the FlickDirect Movie Database.